In his bestselling book The World Without Us, Homelands co-founder Alan Weisman considered how the Earth could heal and even refill empty niches if relieved of humanity’s constant pressures. Behind that groundbreaking thought experiment was his hope that we would be inspired to find a way to add humans back to this vision of a restored, healthy planet – only in harmony, not mortal combat, with the rest of nature. With a million more of us every 4½ days on a planet that’s not getting any bigger, prospects for a sustainable human future seem ever more in doubt. For this long awaited follow-up book, Weisman traveled to more than 20 countries to ask what experts agreed were the probably the most important questions on Earth – and also the hardest: How many humans can the planet hold without capsizing? How robust must the Earth’s ecosystem be to assure our continued existence? Can we know which other species are essential to our survival? And, how might we actually arrive at a stable, optimum population, and design an economy to allow genuine prosperity without endless growth? By vividly detailing the burgeoning effects of our cumulative existence, Countdown: Our Last, Best Hope for a Future on Earth? reveals what may be the fastest, most acceptable, practical, and affordable way of returning our planet and our presence on it to balance. The result is a landmark work of reporting: devastating, urgent, and, ultimately, deeply hopeful. 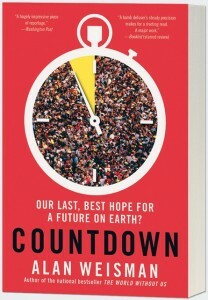 Countdown was the winner of the 2014 Los Angeles Times Book Prize for science writing, the 2013 Paris Book Festival Prize for nonfiction, the 2014 Nautilus Gold Book Award, and the Population Institute’s 2014 Global Media Award for best book. It was a finalist for the Orion Prize and the Books for a Better Life Award.